Fresh from my adventure to Canada, I have more #SummerReadTrip tidings to share! For leg one, I chose to read Gary Schmidt’s retelling of Pilgrim’s Progress. You can read my thoughts on the book and my process of choosing Potawatomi Indian Summer by E. William Oldenburg for leg two here. All packed and ready to go to Canada! I had hoped to accomplish leg three by listening to the audiobook The Birchbark House by Louise Erdrich while journeying north. The car trip would have been perfect for completing the audiobook requirement: reading the traditional way gives me terrible car sickness, and with an audiobook I wouldn’t have to stop reading when it was my turn to drive! But, unfortunately, the book didn’t become available from the library in time to make this happen. Instead I enjoyed taking my time finishing Potawatomi Indian Summer once I arrived in Canada. As the children of the story escaped the fearsome clutches of the Mohawks, my niece and nephew tried to escape the tickling fingers of Uncle Dan and Aunt Ahna. 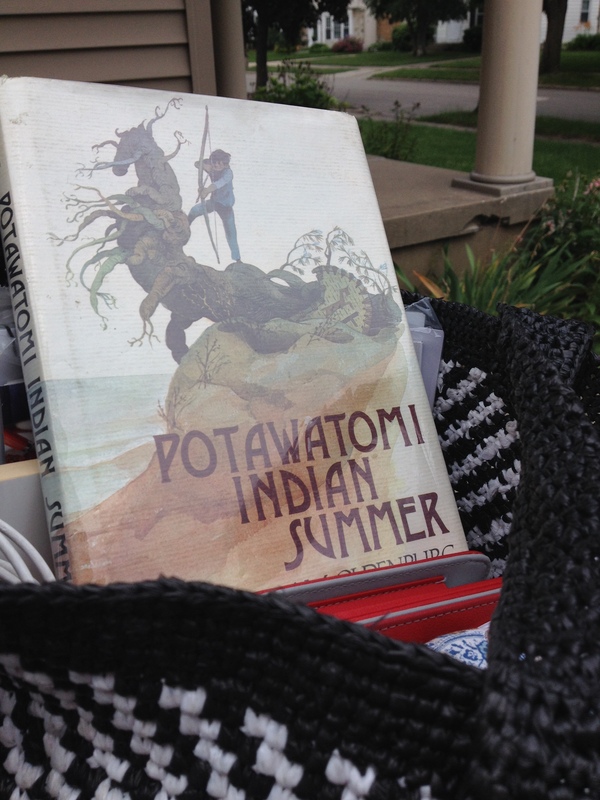 Potawatomi Indian Summer is a charming story about six West Michigan children who inadverdently travel back in time to when Native Americans ruled the coast of Lake Michigan. Finding friendship with the Potawatomi tribe, the children learn many things that have changed in the intervening centuries — and some that have not. Though I was skeptical of how unsurprised the Potawatomis and Mohawks were when they found children from the future, the battles between the two tribes over the kids were satisfactorily scary. After a fishing adventure for all and a daring escape from the Mohawks for the children in the story, we found our way back home to present-day Michigan. Soon I shall be starting leg three by diving into the world of Omakayas, a young Ojibwa girl living on a Lake Superior island in 1847 with Louise Erdrich’s the Birchbark House. Where will your #SummerReadTrip take you?